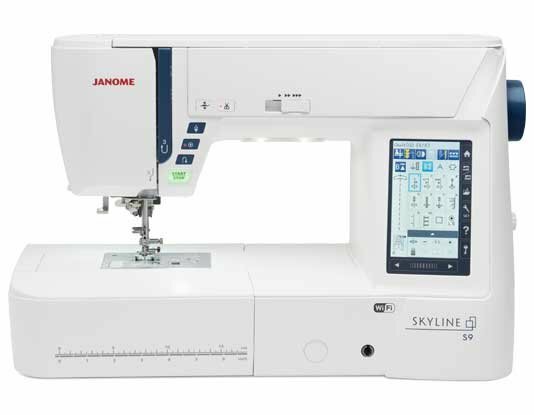 The Skyline S9 is the first machine in its series to include both sewing and embroidery. This great machine includes Wi-Fi capability that makes it easy to send embroidery designs from an iPad or computer straight to the machine. In addition, Janome has developed five amazing iPad apps to help make your embroidery better. Enjoy AcuDesign, AcuEdit, AcuMonitor, and the new AcuSetter and AcuSketch apps. Enjoy choosing up to 250 embroidery designs along with 300 stitches! With a maximum embroidery size of 6.7"x7.9" and sewing speeds of 1000SPM, the Skyline S9 provides a full suite of powerful capabilities to ensure small projects are beautiful, yet easily executed. Navigating through these great features is easy with the Skyline S9's LCD color touchscreen.